Hi Every Creative Endeavor readers! 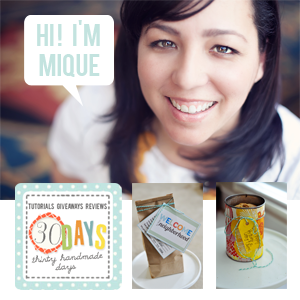 I'm Mique from 30days. I live in the beautiful Los Angeles area with my husband and three kids- 2 boys, 1 girl. I am passionate about my family, friends and creating. I am learning to embrace my role as an autism momma. I also love running the Queen Bee Market with my sister Jessica. Fall is my favorite time of year. 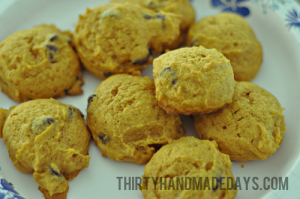 Growing up my mom made everything pumpkin flavored thing she could in the fall. Pumpkin cookies, muffins, bread, pie. Shhhh....don't tell...I actually didn't like pumpkin for a long time because it was a little pumpkin overkill at our house. 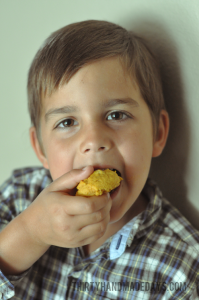 So today I wanted to share some pumpkin chocolate chip cookies and a fun printable tag. 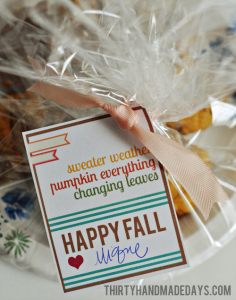 What better way to bring in the new season than with a plate full of cookies and a happy note? Mix well. Place on greased cookie sheet. Bake at 350 for 10-12 minutes (I just do 10 mins, I go for underdone rather than overdone). 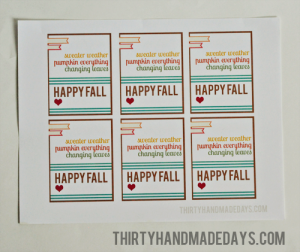 Make your cookies & print out a page of Happy Fall tags. Drop them off at friends or neighbors before your family eats them all up. These cookies would be perfect for new neighbors too. 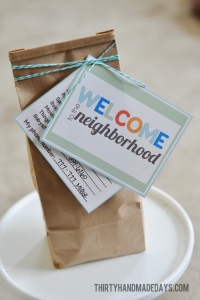 You could attach a Welcome to the Neighborhood card to them. Very Cute and Thanks so much for including your darling tags!! A Lemon Squeezy Home is here tomorrow so come on back!